Athens City School students returned to class after summer recess on Wednesday, Aug. 9. As ninth through 12th grade students walk through the halls of the current Athens High School, just across the street, construction of the new building is well underway. Opened in 1973, the current Athens High School facility has been the educational home to 43 graduating classes and is the alma mater to thousands of alumni. 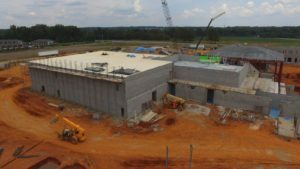 The 2018 May graduates will be the final group to graduate from the current facility, which will become the campus for Athens Middle School once the new high school is complete. Over the past several months, significant construction progress has been made on the new Athens High School. The 1,916 person-capacity storm shelter is 90 percent finished with only the structure’s concrete lid remaining to be installed and the roofing system over the band and choir area is complete. The school is taking shape as nearly all the retaining walls of the facility have been erected. From an aerial view of the construction site, the exterior layout of the school, including what will be a 1 acre courtyard in the center of campus, can clearly be seen. Second floor concrete masonry units for the two-story high school are currently being installed. Mechanical, electrical and plumbing rough-in is underway on the first floor. 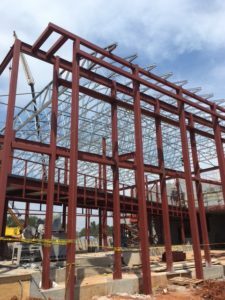 All steel, in what will be the new cafeteria, has been installed, including the steel structure for an elevated bridge which will allow students to cross over the lunchroom from the second floor on their way to class. Metal roof trusses are also being installed over the cafeteria. 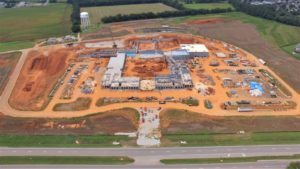 Construction of the new state-of-the-art Athens High School facility, led by Athens-based Martin and Cobey Construction, is on schedule to be completed in November 2018.